The Cascade One Plus Starter Kit is the next big thing from Vaporesso and again they do not disappoint. 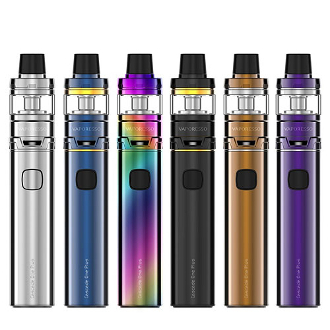 With its sleek and ergonomic design and all new colors the Cascade kit will sure to satisfy your need for clouds and long vaping times between charges. The tank is 510 threaded with a 6.5ml e-liquid capacity. It has a top-filling design with a locking mechanism. This feature helps to keep the tank leak-free. Another feature of this tank that contributes to your leak-free experience is its isolated coil and e-liquid chamber. This great tank has triple adjustable airflow slots as well. This powerful mod box has a built in 3000mah battery and a battery life indicator light to let you know when it needs to be charged. It is powered by OMNI Board Mini and uses a designated micro USB charging cable and port (cable included). It has a simple one button design to make your vaping experience as easy as possible. The Cascade One Box Mod also has Low Voltage and Short Circuit Protection as well.